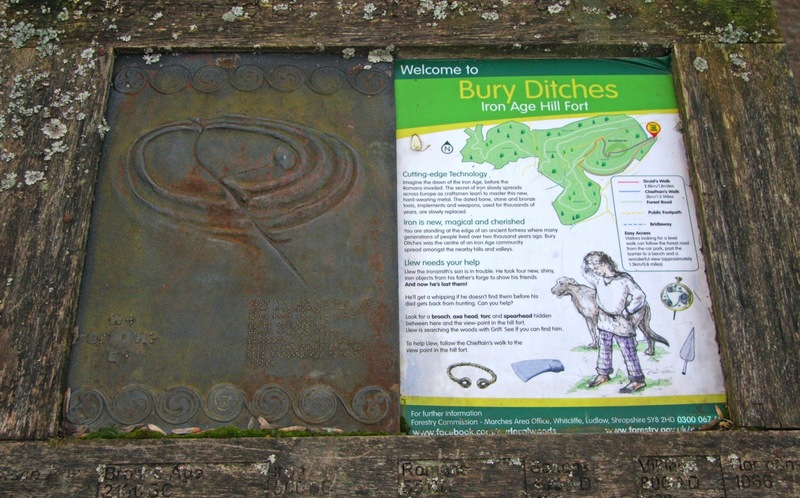 The Bury Ditches form an impressive earthen rampart system of embankment and ditch which dates from approximately 500BC; this Iron Age Hill Fort is one of the most extensive in the country and sits atop a hill whose slopes are immersed by conifer plantation. My goal for the day was a hill that I had not yet visited and one that was close to Lydbury North, whose village hall Jim Perrin was speaking at, at 7.00pm; and this hill fitted perfectly into this plan. 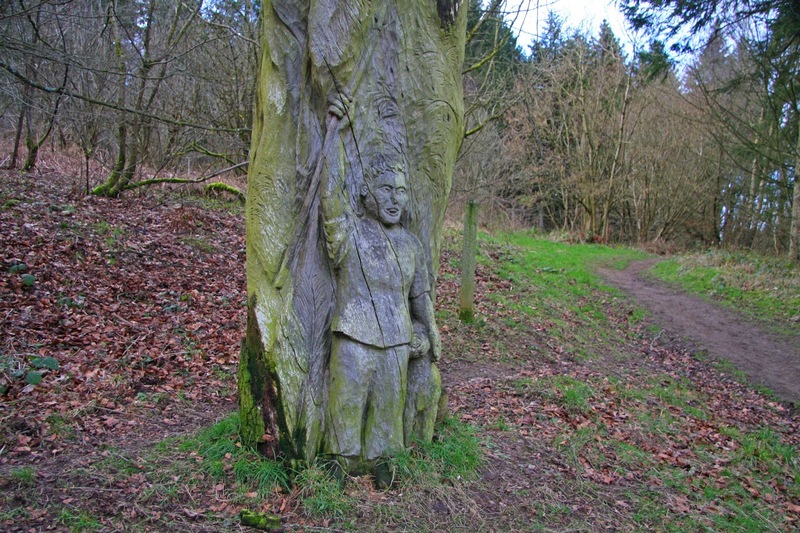 The hill is enclosed by Forestry Commission conifer plantations that until the mid-1970s shrouded the summit, thankfully a storm blew many trees down and sensible action prevailed and the remaining trees from the area of the summit were then felled. 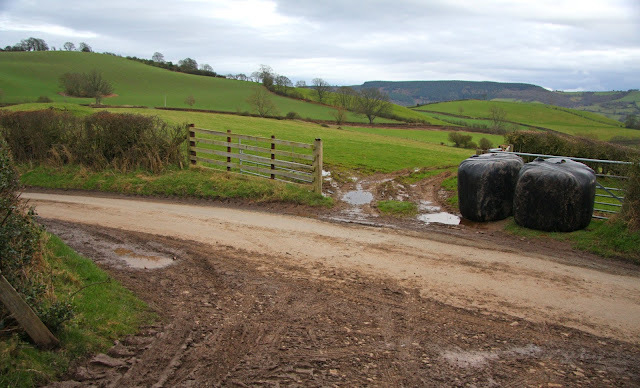 This now gives the summit a spacious feel and affords extensive views to the higher Shropshire peaks. The hill is listed as a Submarilyn and a 390m Sub-Four (The Fours - Europeaklist December 2013 and Haroldstreet January 2014) with c 146m of drop; the former compilation lists the hill by the name of Sunnyhill, whilst the 2nd edition of the latter has amended the name from its 1st edition to the Bury Ditches, with both names appearing close to this hill's summit on contemporary Ordnance Survey maps. Local enquiry suggests that the former name is more applicable to the southern slopes of this hill, whilst the latter name is the locally known contemporary name for the hill. 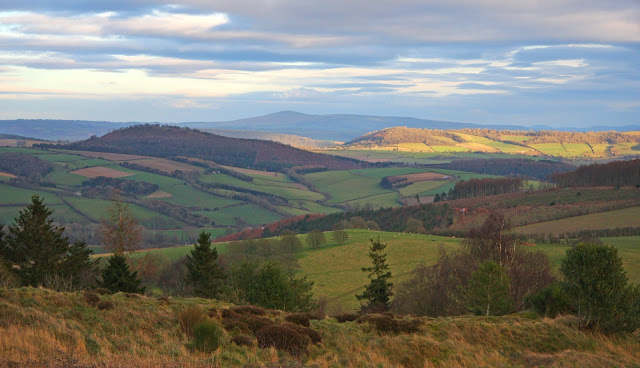 I waited until 3.00pm before packing the car and driving toward Bishop’s Castle, and as the summit is positioned closer to Lydbury North compared to its col, I decided to investigate the col first and leave the summit for a late afternoon ascent. 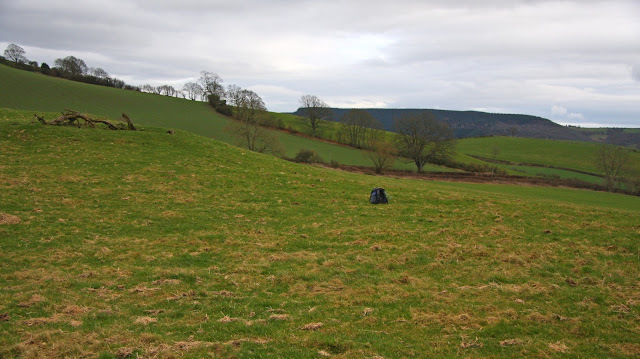 The critical col for this hill is positioned in or next to a field that has a bump in it, the top of this bump is given a separate 250m ring contour on Ordnance Survey maps. The first of four data sets taken at the area of the col with the Trimble gathering data on top of the gate post. 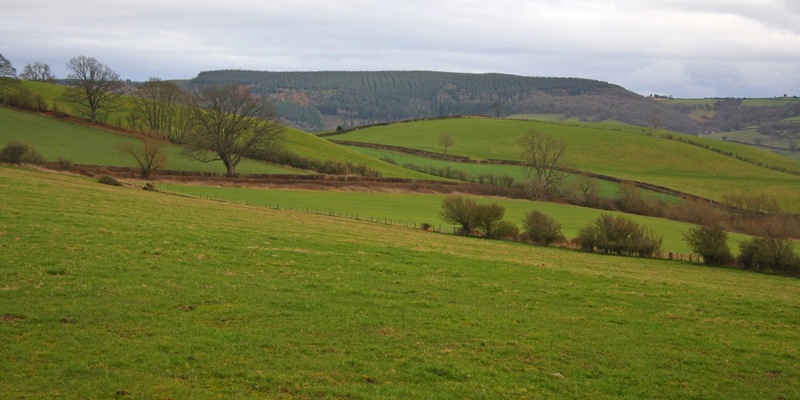 The field where the col is situated is beyond the gate entrance with the top of the 250m ring contour bump just above the hedge on the left hand side of this photograph. I squeezed my car against a hedge on the minor lane just to the west of this field and set about trying to work out the lay of land, I imagined that the hill to hill traverse was more critical than the direction of the valley to valley traverse, as contours and a whizz around in a Google car suggests. I wanted to take at least two data sets from the col, one either side of the 250m ring contoured bump, and I ended up taking four and spent a contented hour doing so. Time spent standing in a field next to a main road and minor lane is an unusual occupation to say the least, but there is a pleasure in doing such a thing. Once four data sets had been taken I drove north and then south toward Lower Down and the car park that gives access to the summit of the hill. The car park is positioned on the eastern side of the hill and at 310m high it gives easy access to the Bury Ditches. As I pulled up a woman was heading toward her car, we talked for ten minutes or so, she lived in Churchstoke having relocated from Birmingham and told me that she used to bring her young children here for walks, they are now in university. She kindly pointed me in the right direction and told me about other paths and how they connect. As another car pulled up I headed up the good track toward the summit. 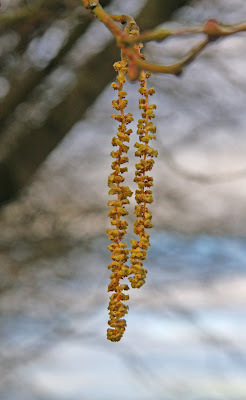 I stopped occasionally to take photographs and peer through the trees to the blued sky beyond, there was a distinct smell of awaking to the land, with slight warmth heralding the onset of spring and catkins slumbered down from their delicate branches, motionless they hung, as neither wind nor breeze blew. The track led to a gate which gave access to the eastern entrance and the impressive earthen ramparts, these consist of at least four with their ditches accentuating their form, each a shaped series of ovals, and they stood similar to a flowing wave caused by plopping a small stone in a pond. I followed the path to the viewfinder; just beyond on the inner rampart is the high point of the hill. 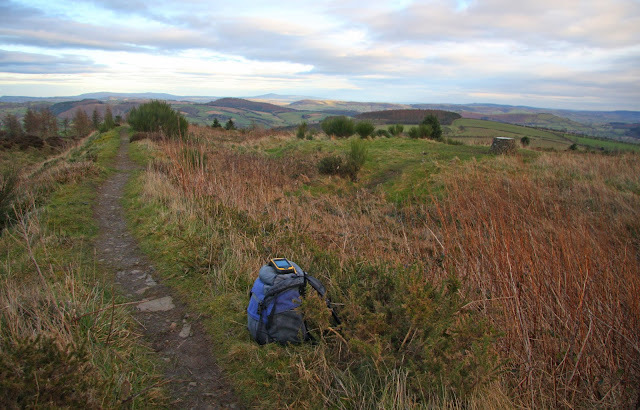 Within a few minutes the Trimble was set up on my rucksack and five minutes of data collected. As the Trimble gathered its allotted data the late afternoon cast shadowed colour across distant hills, a slight chill had now replaced the early sprint warmth and the land seemed ready to slow and become darkened by the onset of dusk. I stood and soaked in the scene before packing the Trimble away and proceeded to follow the inner rampart for the whole length of its journey through the ancient western gate where overlapping ramparts and ditches are still on view, and onward back to the modern entrance gate and the descending track toward my car. By the time I had changed and driven to Bishop’s Castle for food, the sun had sank leaving streaked greying cloud, it had been a good day, and one that still held the prospect of the evening spent listening to the eloquent openness and beauty of Jim Perrin.